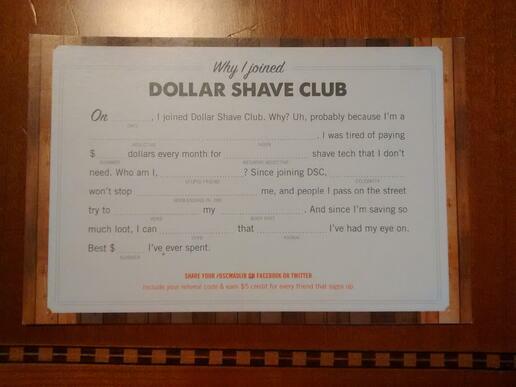 Full disclosure here - I'm a Dollar Shave Club (DSC) client. Not to be confused with being a Hair Club for Men client - which I'm not (but could be). 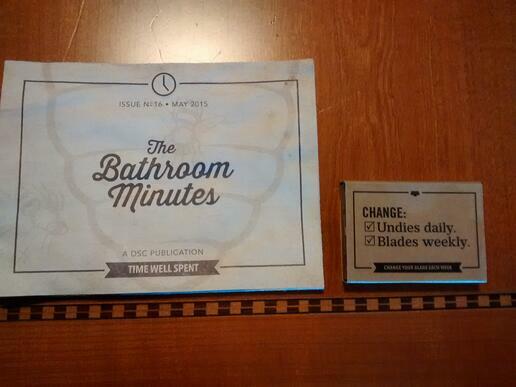 Every other month I receive a new set of razor blades from DSC packaged with some witty content. See below for my latest shaving swag. I truly find my DSC mailing fun. Not only do I receive a set a 5 new shaving blades for way below retail cost, DSC also brings a quick smile and chuckle to a typically busy day. DSC consistently offers a bit more value than if they had just mailed blades in non-descript packaging. What I particularly liked was a postcard DSC sent shortly after I signed-up. It's fill in the blank and lets you craft an irreverent story to send to a friend about how amazing your life has become since you began receiving DSC blades. And it's a postcard - that old-school marketing dinosaur. Although we regularly see the value of inbound techniques here at LyntonWeb, it's useful to remember that inbound and content marketing can be successfully blended with more traditional marketing methods like postcards. If you're already mailing products or invoices, you can easily include a link to a landing page on your website with a free or discounted offer. You can use the conversion rate to test the effectiveness of your direct mail campaign and even compare it with online campaigns. The takeaway here - create omnichannel content. Content that can be used anywhere and everywhere. Don't limit yourself to digital content, especially if your audience is open to different modalities of content. In fact, DSC has built it's own content team to focus on a wide array of content initiatives. Remember to 'set your content free' and don't hesitate to experiment.